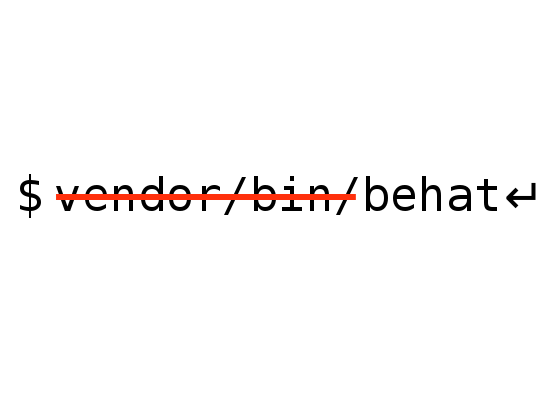 In this tutorial I will explain how to execute composer vendor binaries without typing vendor/bin every time. Vendor binaries are command line scripts come with the composer packages you install. Some vendor binary examples are PHPUnit, Behat, PHPSpec, Doctrine. I will use Behat in the tutorial. Normally when Behat is required a symlink is created in vendor/bin. To execute it you need to type the relative path of the Behat executable (vendor/bin/behat). Now when you type behat your shell will find Behat executable in vendor/bin directory. Note 1: You will be able to execute behat only when your current working directory (cwd) is project root. Note 2: If you have another behat in a directory that has higher precedence (e.g /usr/bin) that will be executed instead. Thanks for the tip, it was what I was loooking for, didn’t know you can add relative paths into the path. However, I don’t know why this was working before in same machine same user, I have build logs where it got the scripts and executed.